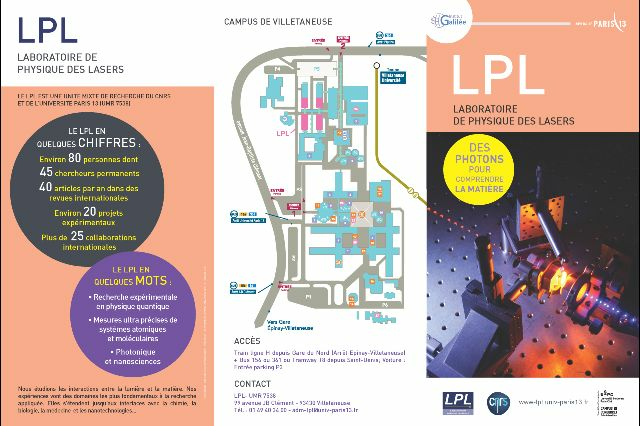 Laser Physics Laboratory is affiliated both to CNRS and to University Paris 13. We study the interactions between light and matter. Our research activities are mainly experimental and cover several multidisciplinary domains. The lab is structured into five research axes and benefits from four workshops and an administrative department. It is composed of about eighty people (10 CNRS full-time researchers, 30 university teaching staff members, a technical staff of 15 people, about 25 PhD students and post-docs), plus several short-term trainees and foreign visitors.